The phenolic compounds, flavonoids in particular, are very frequent in the plant kingdom with many beneficial properties. Some of these compounds are present in exudates or buds of plants. They appear in propolis as a consequence of the collection and transformation by specialized honey bees in the hive. The aim of the study is the determination1 of phenolic compounds by UPLC-MS/MS and UPLC-PDA in methanolic extracts2 of 134 samples of propolis from Castilla y León (North and Centre of Spain). Such samples were gathered using high density polyethylene mesh for food use which placed in Langstroth beehive from April 2011 to August 2012. The results obtained reveal the interesting source of bioactive compounds of the North and Centre of Spain propolis, being the most significant caffeic acid and its derivatives (CAPE and isoprenyl caffeate), chrysin, pinobanksin, p-coumaric acid, galangin and kaempferol; other compounds identified only in some samples were benzoic acid, trans-ferulic acid, taxifolin, luteolin, sakuranetin, apigenin+genistein and eriodictyol. Furthermore, the content of CAPE and isoprenyl caffeate may restrict its use, for the food and pharmaceutical industry, since they are considered allergens3. 1. 1 Kasote, D., Suleman, T., Chen, W., Sandasi, M., Viljoen, A., van Vuuren, S. (2014) "Chemical profiling and chemometric analysis of South African propolis", Biochemical Systematics and Ecology, 55, pp. 156-163. 2. Dias, L. G., Pereira, A. P., Estevinho, L. M. (2012) "Comparative study of different Portuguese samples of propolis: pollinic, sensorial, physicochemical, microbiological characterization and antibacterial activity", Food and Chemical Toxicology, 50, pp. 4246-4253. 3. Walgrave, S. E., Warshaw, E. M., Glesne, L. A. (2005) "Allergic contact dermatitis from propolis", Dermatitis, 16(4), pp. 209-215. ISNAD ADANERO-JORGE, Félix , GARCÍA-FERNÁNDEZ, M Camino , VALENCIA-BARRERA, Rosa M , SANZ-GÓMEZ, J. Javier . "Phenolic Compounds of Spain Propolis". 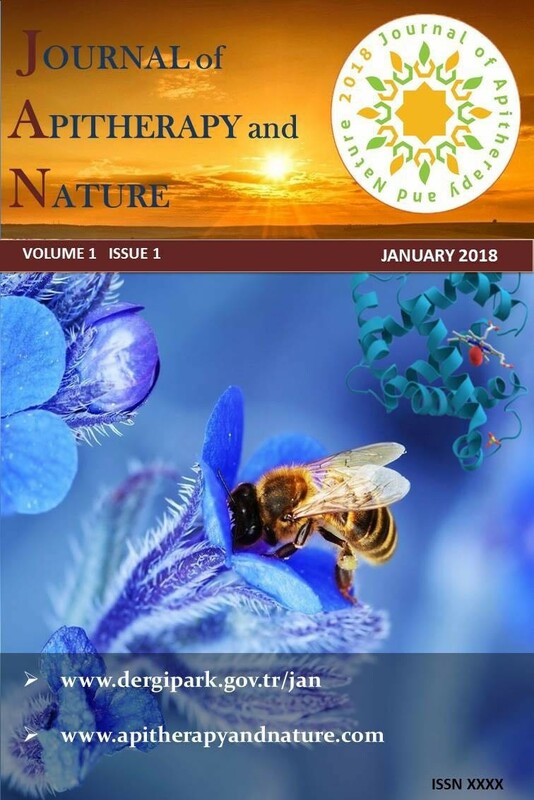 Journal of Apitherapy and Nature 1 / 3 (December 2018): 34-34.